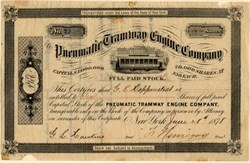 Beautiful certificate from the Pneumatic Tramway Engine Company issued in 1878. This historic document has an ornate border around it with a vignette of a Tram car. This item has the original signatures of the Company's President, and Treasure, and is over 135 years old. Cut border on upper right side and lower left. Light tape residue on the back.